The PC manufacturer Lenovo has two new affordable ThinkPad laptops in their release schedule. ThinkPad E485 and E585 are affordable business laptops based on the Intel models ThinkPad E480 and E580. So far, the available selection of laptops with the AMD Ryzen Mobile CPUs (codename: Raven Ridge) is rather limited – despite the good performance of these new chips. The Chinese manufacturer Lenovo for example has only one laptop with Ryzen on the market as of now, which is the consumer-focused IdeaPad 720s-13ARR. The 2018 ThinkPads are all Intel-based. This state of affairs may change soon, as Lenovo will release two new low-end ThinkPads with Ryzen Mobile. The new models ThinkPad E485 and ThinkPad E585 are based on the ThinkPad E480 and ThinkPad E580. 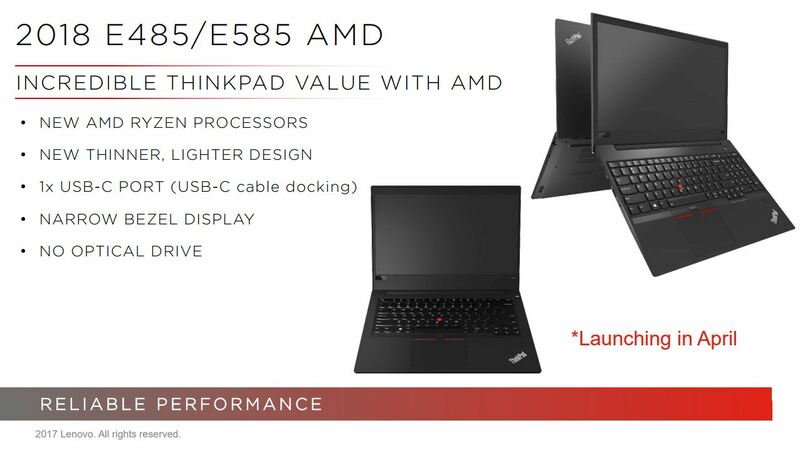 The E485 and E585 could be a substantial expansion of the Ryzen laptop-portfolio, as even E-ThinkPads feature the renowned ThinkPad keyboard and TrackPoint. The release of those models could also allow for some interesting comparisons, as their Intel-counterparts E480 and E580 did exhibit some heat problems caused by the combination of the Intel Kaby-Lake-R CPUs and the dedicated AMD Radeon RX 550. It is possible that the AMD-equipped models will fare better, which Notebookcheck will undoubtedly find out when we get our hands on them. Lenovo will release the ThinkPad E485 and ThinkPad E585 in April.